Fun, dynamic dishes like the Mezze Platter, are a perfect counterpart to the trendy bar scene and live jazz music at The Beehive. After dining at The Beehive, in Boston’s very trendy South End, I knew I had to share about it for my next Where to Bite. It’s not the kind of restaurant I’d typically write about – the vegetarian options were limited, and the menu was big on fried potatoes and cheese. 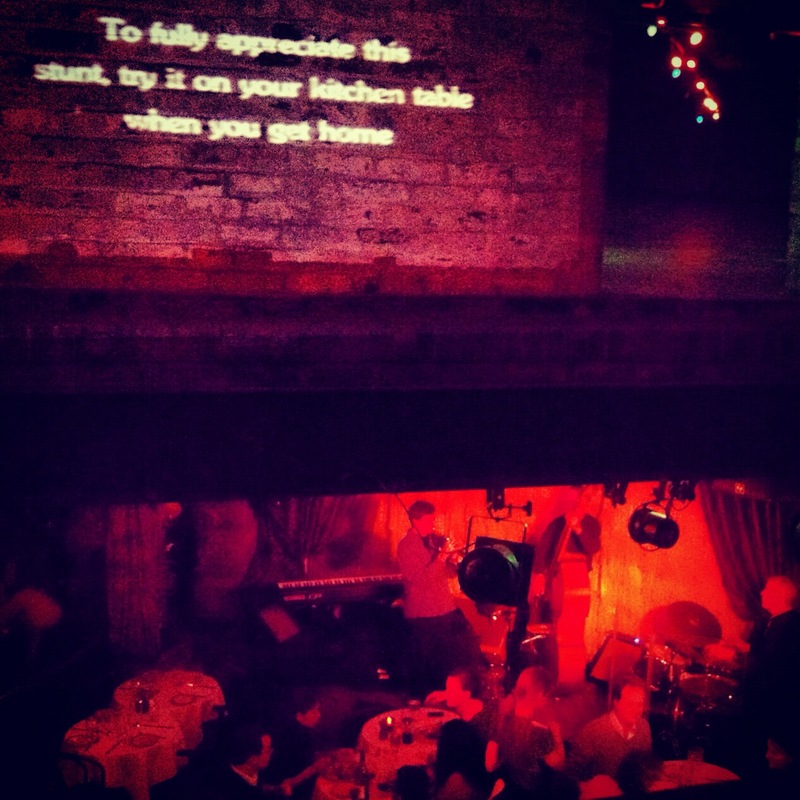 But The Beehive was about way more than just food – it’s an experience I’d recommend to any foodie or music lover. This ecclectic spot has a lively bar scene, a diverse menu, and features live jazz music every day of the week. My best friend Heather’s birthday was the perfect occasion to try out this highly touted spot, which I first heard of on the Food Network – a trend, I suspose , as that’s how I discovered Deuxave, too. Sunflower seeds bring texture and protein to this light, seasonal salad. 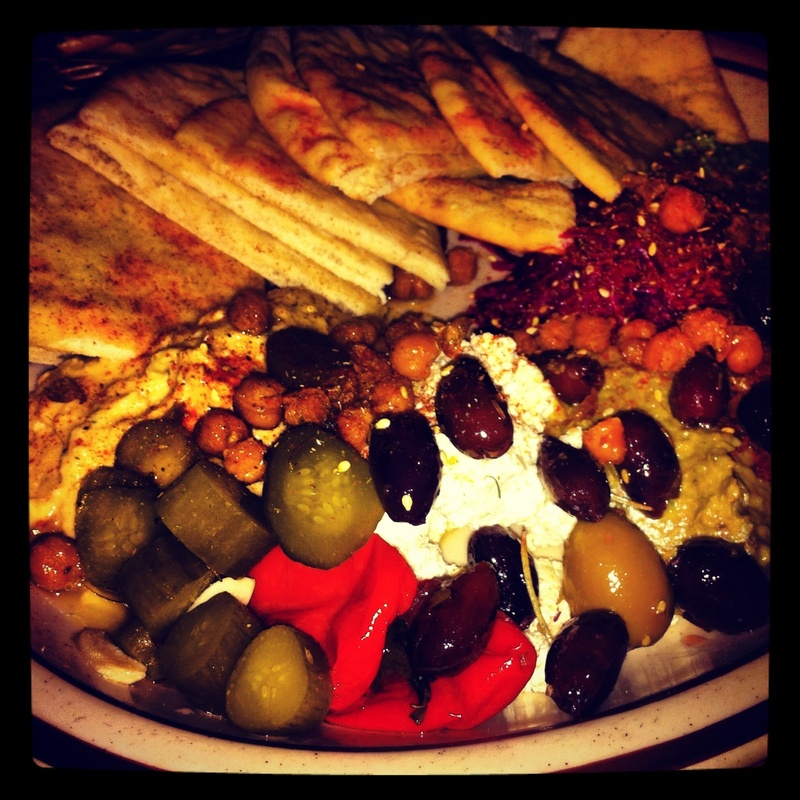 Recommended Dishes: Heather and I started our evening with the Mezze Platter Deluxe. This plate, pictured above, is a huge array of Mediterranean salads and spreads – in addition to the standard hummus and baba ganoush, the Mezze Platter came with Muhammara, a roasted red pepper dip, carrot puree, a beet salad, a sweet English pea spread and a whipped jalapeno feta. Greek olives, pickles, sweet roasted peppers and toasted chick peas accompanied the spreads, as well as slices of toasted pita. All vegetarian, and vegan without the feta, this is an ideal dish for sharing. The Not-So-Good Bite: It’s not uncommon, but the menu at The Beehive definitely features heavier dishes. Here, you can begin your evening with truffled potato and cheese pierogies, have a chicken schnitzel entree, and follow it with a side of cheese and gravy fries. The menu’s unique culinary perspective is ethnic comfort food – Morocco, Germany, France, and the good old United States are strongly represented. But as is usually the case with comfort food, the soul – not the body – is the primary consideration. Portions are large, and there’s plenty of cheese. Heather and I had appetizers as entrees, and were more than satisfied. Try this, or splitting a main with a friend, to keep things light. The Good Bite: There’s something for everyone. With The Beehive, there’s no reason to have the pre-dinner argument about what type of food to get. There’s something for everyone, at least once. 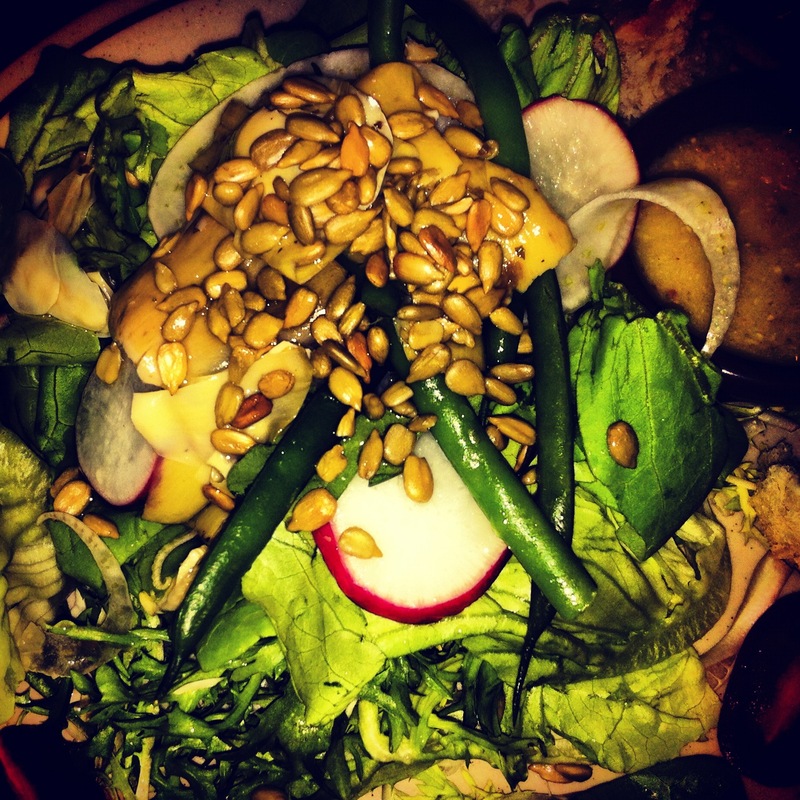 The Market Salad appetizer with local lettuces, artichokes, tomatoes, green beans, shaved fennel and a generous pile of sunflower seeds made for a satisfying and healthy dinner. Other vegetarian option include the Vegetarian Morroccan Couscous, Farm Fresh Eggplant and Spinach Parmesan, and the Frisee Salad (hold the duck bacon). The Best Bite: For three hours, Heather and I sipped signature Beehive cocktails, tried to decide on our favorite Mediterranean spread, and listened to live jazz music. After the Dinner Jazz Set, Sinclair Jennings with the Abs took the stage. We watched the performance from our exceptional balcony seat, where we could watch clips from silent movies projected onto a brick wall. The atmosphere and the live music means, no matter what cuisine your craving, The Beehive is a must-do. A priceless seat, funky jazz music, and good food made for a fabulous night out. Make the trip to The Beehive for a meal worth splurging on. Eat something a little too comforting, spend a little too much time, and maybe spend a little bit too much – nothing is overly excessive, and everything is worth it. Until next time, I’m off to bite, and listen to, another new bite.